"2016 Lead Worker Student Staff READ Poster" by Michael Backus, Natalia Wan et al. 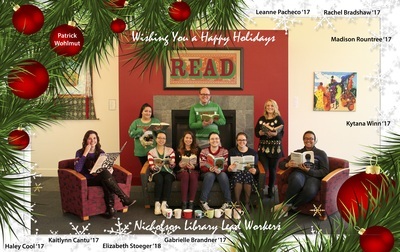 Nicholson Library lead student workers Leanne Pacheco '17, Rachel Bradshaw '17, Madison Rountree '17, Kytana Winn '17, Gabrielle Brandner '17, Elizabeth Stoeger '18, Kaitlynn Cantu '17, and Haley Cool '17, and Patrick Wohlmut (Teaching and Research Librarian) celebrate reading during the winter of 2016. Backus, Michael; Wan, Natalia; and Nicholson Library Staff, "2016 Lead Worker Student Staff READ Poster" (2016). READ Poster Gallery. Image. Submission 155.